Elegant synchronicity. The Independent reports that BBC Radio 3 is to broadcast twelve days of Mozart to the exclusion of any contemporary music. 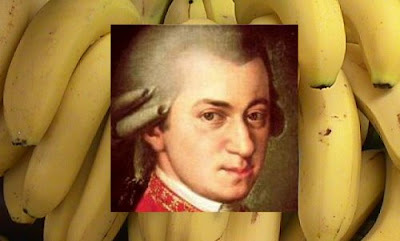 Popfi.com reports that the latest Japanese food fad is bananas ripend to the strains of Mozart sonatas and concertos. Will the BBC bring back John Peel to present their Mozart fest? Am I allowed to be pleased by the 12 days of Mozart? Yes, I can see that it's indulgent - but it's hard to think of any other Good Thing where too much is still not enough. Could one think of it as, to some extent, an experiment - how do one's thinking patterns change on a diet of one composer? UA, it is not the indulgence that gives me a problem, although Heavens knows there is enough of that on BBC Radio 3. What gives me a problem is the sheer pointlessness of it. What is actually achieved by playing back to back Mozart for twelve days? Will we understand more about his genius? Will we see him in a new light? No, of course we will not. Great art depends on contrast. And even a composer as great as Mozart cannot provide the contrasts required to sustain twelve days of broadcasts. Think for a moment as to why Radio 3 is really doing this. Is it to tell us more about Mozart? Or is it to provide a media friendly stunt in a desperate attempt to stop the continuing slide in the station's listener figures?